In a galaxy very, very near to us, Ecliptic Brewing Company has created some epic brews for us to enjoy. The term out of this world is definitely something that applies to the people at Ecliptic Brewing Company. They have created a vast array of craft beers that are all space themed. 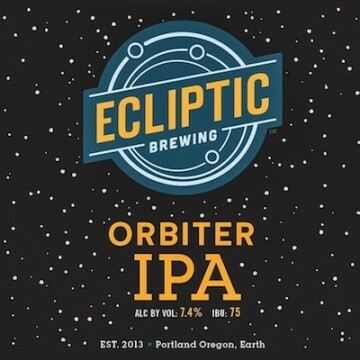 With the recent release of the new Star Wars movie: The Force Awakens, it is only fitting that Ecliptic Brewing: Orbiter IPA is this week’s Vegas Pub Crawler featured beer of the week. Established in 2013, the Portland based brewing company may be one of the newer kids on the block, but have been in the brew industry for over 20 years. John Harris is somewhat of an icon when it comes to the craft brewing world. Before he started Ecliptic Brewing, he was with McMenamin and then later moved on to Deschutes where he has created some of their most notable craft beers to date. The unique name comes from John’s love of brewing and astronomy which is why all of the craft brews have names resembling space. Orbiter IPA utilizes bitterness flavoring from three different hops: cascade centennial, chinook and columbus. This drink is quite special for those who enjoy a good IPA as it has a higher rating than most typical IPA’s will have on the international bitterness unit. A typical IPA will score around a 60 while Orbiter IPA hits a 75 IBU. There are citrus notes that are brought out in the caramel malt brew and dry hops are used to intensify the aromas and taste. Orbiter brew contains 7.4 percent of alcohol by volume (ABV) and registered 16.2 of gravity. While the term gravity fits perfectly in the astronomy theme, it is a term that denotes the amount of sugars that are in the brew before fermentation. The higher the gravity content the longer the liquid will need to fermentate and the stronger the brew as sugar is what is fermented to create alcohol. While you may not find this particular brew on draft during your Vegas Pub Crawl, you can order Orbiter IPA and other great craft brews on their website or if you are ever in the Portland area. Enjoy a large number of craft brews and cocktails on your Downtown Las Vegas Pub Crawl. Contact us today to book your experience.